Does anyone else feel like the holiday season SERIOUSLY snuck up on them this year? That’s how I’m feeling right now! 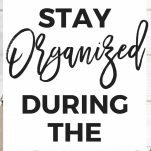 Don’t get me wrong, I love the holidays, but if I didn’t put strategies in place every year to stay organized during the holidays, I would be LOST. 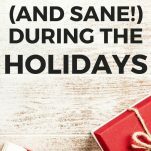 In this post, I’m sharing all of my strategies for staying organized AND sane during the holiday season! The holiday season may last from Thanksgiving until New Years, but let’s be real, planning for the holidays starts WAY before that for some of us. First, there’s planning the where and when. I don’t know about you, but I always feel like by mid-year I’m trying to figure out where I’ll be when during the holidays. Then, as we get closer, it’s a matter of figuring out who I have to buy gifts for and how much I have to spend. And honestly, the earlier I can start my Christmas shopping, the better! Trust me, you’ll be SO glad you started planning for the holidays as early as possible! You’ve probably heard that quote before, but are you really living by it? Everyone has a LOT going on during the holidays. If you aren’t intentional about setting priorities in your life, someone else will. And they probably won’t be what YOU want, but what THEY want. 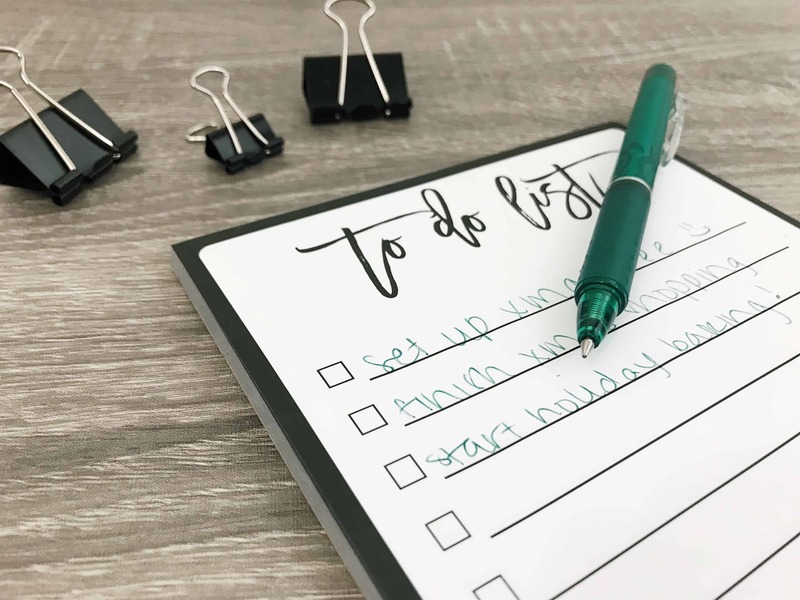 Knowing your priorities ahead of time makes it WAY easier to set boundaries in your life, especially during the holidays. Know what is MOST important to you. And while some opportunities that arise during the holidays might seem like good ideas, they might conflict with something that is actually more important to you, like time with loved ones. 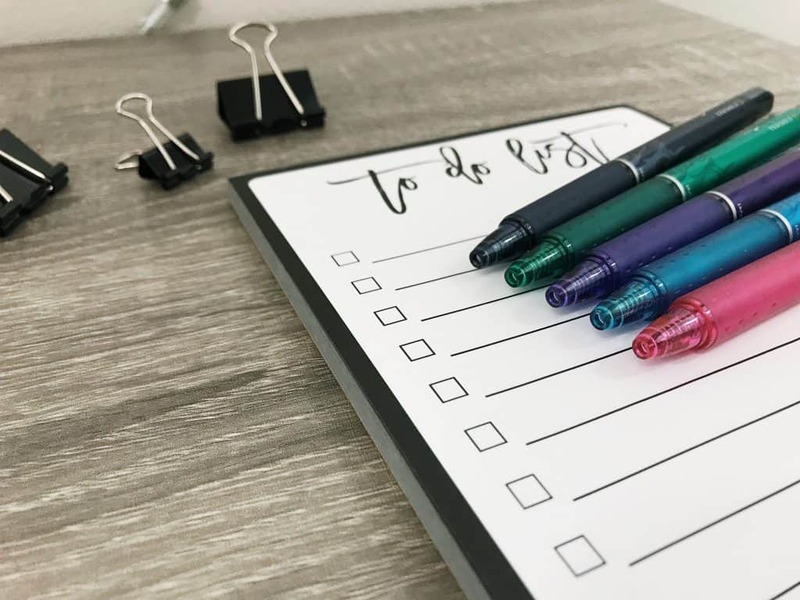 You guys know I LOVE my to-do lists, so it definitely shouldn’t come as a surprise that it’s the FIRST thing I do to get myself organized for the holidays! There is a LOT going on during the holidays. There’s holiday shopping. There are holiday parties. There’s the decorating. The cooking. It can get REALLY stressful REALLY quickly if you aren’t prepared! When I’m ready to start planning for the holidays, the first thing I do is sit down with pen and paper and just do a huge brain dump of EVERYTHING I can think of that I need to do, buy, make, etc. 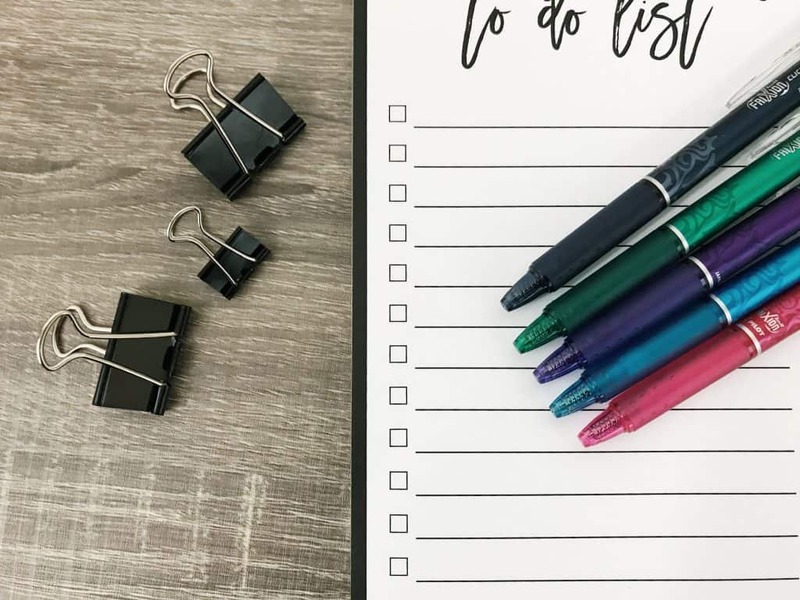 As a side note, since you all know I’m a bit of a to-do list junkie, it should come as NO surprise that I have some favorite list-making tools that are ALWAYS my go-to. Okay, okay – I may be a little biased. 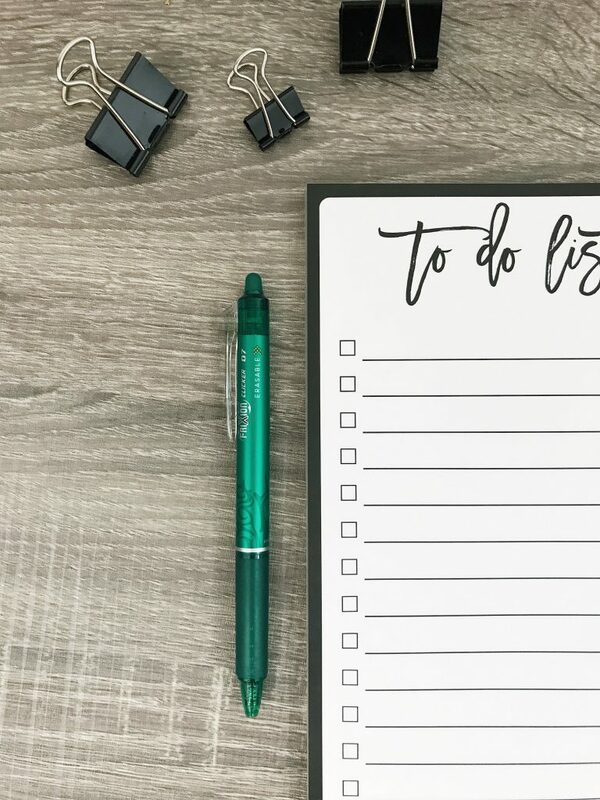 For my favorite to-do lists, I’m ALL about the to-do list notepads I make and sell. As far as pens go, my go-to pens are the FriXion® Pens by Pilot Pen. Pssst…see that image up there ^^? Make sure to hover over it and click on it to shop the pens! First of all, the colors. Let’s be real, sometimes you just want to spice it up with some different colored pens. After all, the holidays are supposed to be festive, right?? That’s a bonus for me after the pen’s smooth writing gel ink. And the biggest selling point for me? The fact that they’re ERASABLE! I may live and die by my to-do lists, but that doesn’t mean they don’t change a LOT. And erasing and rewriting is a heck of a lot prettier than having stuff scribbled over ALL over the page. P.S. 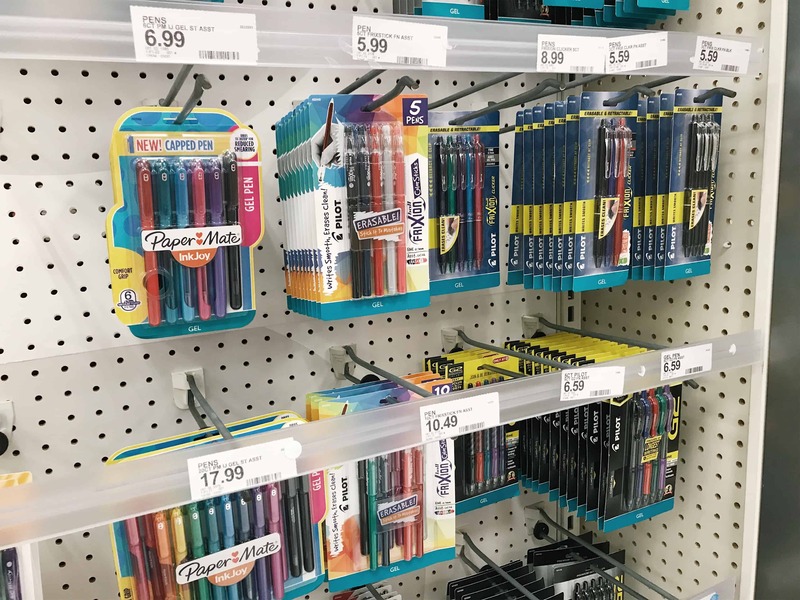 Did I mention the Cartwheel offer for the FriXion pens? It’s 15% off from TODAY until December 31! You don’t need me to tell you that the holidays can get expensive. With everything from gifts to decorations to food, those little expenses tend to add up. And some of them can really sneak up on you! Without fail, there is always something I forget to factor into the holiday budget that I end up needing to spend money on. Once you’ve written down EVERYTHING you need to do and buy and bake during the holidays, it’s time to put together that budget! Go through everything closely to make sure you’re not missing any little expenses. Who are you shopping for? How much will you spend per person? Do you need to buy new decorations? How much will you spend? Are you hosting any holiday parties that you need to factor in? Are you attending any holiday parties where you’ll need to bring food? Are you doing any traveling? Should you be budgeting for gas or plane tickets? This is really just the most common expenses, but it’s not all inclusive! Go through YOUR to-do list and make sure your budget is comprehensive. Trust me, you’ll be SO happy later that you did! Flexible is one thing that most people, unfortunately, are NOT during the holidays. We tend to be slaves to our traditions, and deviating from the norm can cause contention with family. And while I love the idea of holiday traditions, and I love my own family’s traditions, I’ve also learned that flexibility is a MUST. First of all, there’s probably going to come a time (if there hasn’t already) when you have to factor other people into your holidays, specifically a significant other, in-laws, or kids. And the other people in your lives will go through the same thing. At the end of the day, it’s not about the DATE, it’s about the quality time with family and friends no matter when it happens. So if your family Christmas happens to fall on December 27, just roll with it. Plus, if you’re stressing about how you’re going to fit EVERYTHING in, flexibility is key! I swear, there is NO other time of year that creates as much clutter in a home as the holiday season! First, the holiday decorations that sit in storage for most of the year are now all over your apartment. Sure, they may be festive. But they can also take up a LOT of space. Then, you’ve got all the gifts you’ve purchased for other people, just sitting in a pile waiting to be wrapped. Or if you’re one of those proactive few who wraps your presents right away, they’re just sitting there waiting to be delivered. And after Christmas, you’ve got any gifts you’ve brought home that it’s now time to find a home for. If that Christmas clutter is stressing you out, it MAY be time to set some boundaries. First of all, do you really NEED all the decorations you have? There were a few years where I was ALL about buying ALL the Christmas decorations but quickly learned that setting them up and taking them down was a hassle, and I wasn’t enjoying having THAT much clutter. Seriously, this is one of those times when a little goes a LONG way! Next, let’s talk gifts. I get that there are some people you just HAVE to buy gifts for. And don’t get me wrong, I love Christmas shopping…to an extent. If possible (and it probably is possible) narrow down the number of people you shop for. It will save you time, space AND money. Seriously, just a quick text to my brother decided that we wouldn’t exchange gifts. Now that’s one less person we each have to shop for, and neither of us will be offended by the lack of gift. If there’s one time of year where the ability to say no REALLY comes in handy, it’s the holidays. 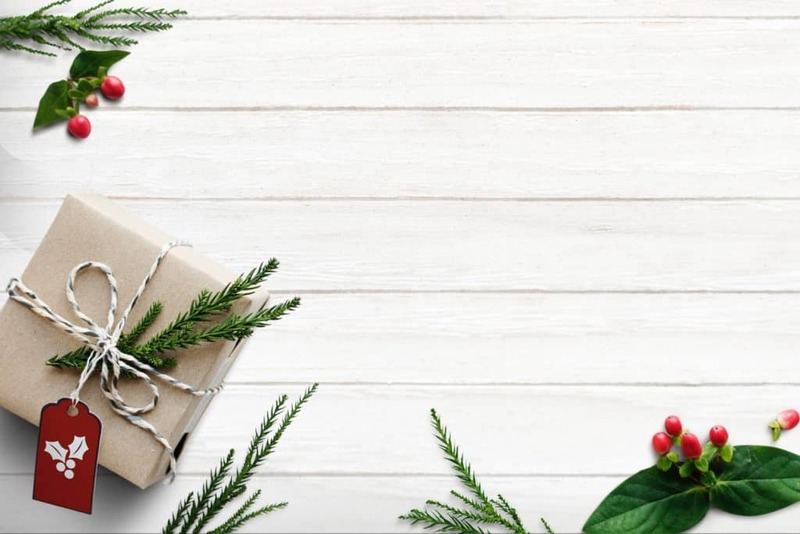 The holidays may be thought of as the season of giving, but really it seems like everyone WANTS something from you, whether it be time, money, gifts, etc. Everyone has a holiday party they want you to attend (and probably cook something for). Your family wants you to stay longer and longer for the holidays. There are SO many people to buy gifts for, from the obvious (family) to the less obvious (bosses and coworkers). It seems a bit neverending. If you’re a people-pleaser like me, saying no is NOT easy. Seriously, I get anxiety when it comes to turning someone down or disappointing them. I feel like I’m letting them down. But just remember that your time and money are just as valuable as everyone else’s during the holidays. And whether you’re saying no because you have other plans or because you would rather stay home in your yoga pants, put YOU first. The holidays can be stressful, no doubt about it. But with just a LITTLE organization and planning, you can make the season a LOT easier! This Christmas, make sure to incorporate these tips to make YOUR holiday go more smoothly. 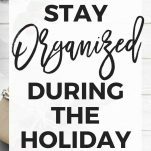 And don’t forget to leave a comment and let me know YOUR best tips for staying organized during the holidays.